Living Walls are the latest trend in indoor and outdoor urban gardening. The living walls can be mounted to existing structures or freestanding on mobile platforms, illustrating your company logo or simply beautifying your space. How Do Living Walls Work? 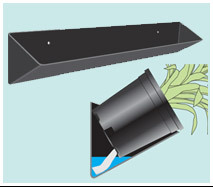 The essence of a living wall is the planter tray, which can be mounted to a metal frame or wall. These are available in a number of different sizes and are stacked to build the foundation of your living wall. Next, wicks are added to the bottom of each pot to allow the plant access to the water that it needs to survive. And finally, the pots are placed in the planter trays at an angle to create your custom living wall. Sure, living walls are beautiful, but did you know that they can help improve indoor air quality? Living walls can help to replenish oxygen in the air, resulting in employees who are more awake, alert, and thus more productive in the workplace. Studies also show that plants and living walls can improve a person's mood and reaction time and lower stress.